3 Step: Length when deployed: 34", Width when deployed: 12.5", Length when stowed: 14.5", Height when stowed: 1.8", Centerline width: 10.13". 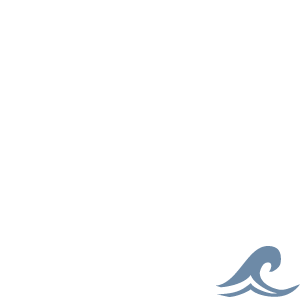 Just drop this telescoping ladder from Windline over the boat side to create a safe and comfortable way to climb up to your boat after a swimming or diving session mid sea. Made of thick-wall stainless steel tubing with electro polish finish, this over platform ladder is durable and resists corrosion. 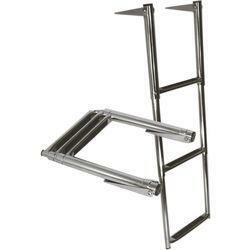 Thick-wall stainless steel tubing construction Electro polished for corrosion resistance Folds easily for compact storage Thanks to the plastic treads on the steps, this ladder ensures safe and comfortable boarding. 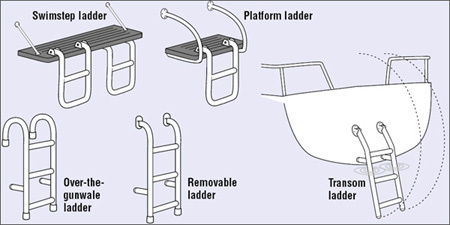 This boat ladder easily mounts to the top of swim platforms, and folds flat on the platform top for stowage.